After weeks of long nights and shut-in weekends finishing up my MA project (and an extremely long Chicago winter), I decided this past weekend to treat myself to a herping day trip somewhere outside of Chicagoland. 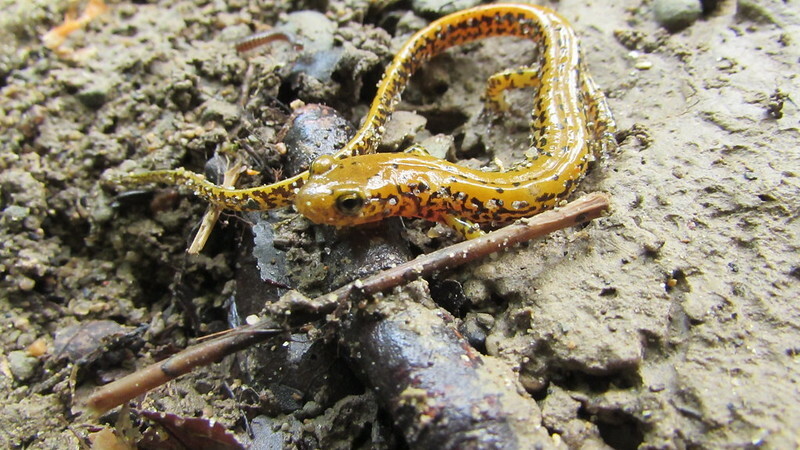 Generally, my destinations are planned around salamander diversity; this one was no exception. 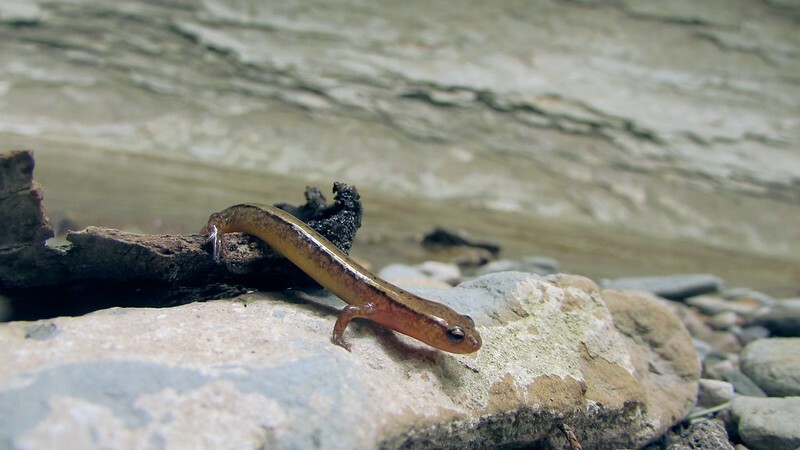 I'd been checking out range maps (courtesy of https://www.pwrc.usgs.gov:8080/mapserver/naa/) for locales within a three-hour drive, and found that west-central Indiana boasted long-tailed, two-lined, slimy, zigzag, and even cave salamanders. So, rousing myself at the ungodly hour of 5:00 am on Sunday, I made for Shades State Park in Montgomery county to see what I could find. I was particularly hoping to find cave sallies, a lifer for me. However, after a winter cooped up in Chicago, *any* herpetofauna was going to be a welcome sight. Once I got to the park, I went in search of a creek. The first stream I came across looked promising: second- or third-order, shallow, low-gradient, slate-bottomed, and about 3-6 meters across, with a steep sandstone ravine to one side and mixed forest to the other. 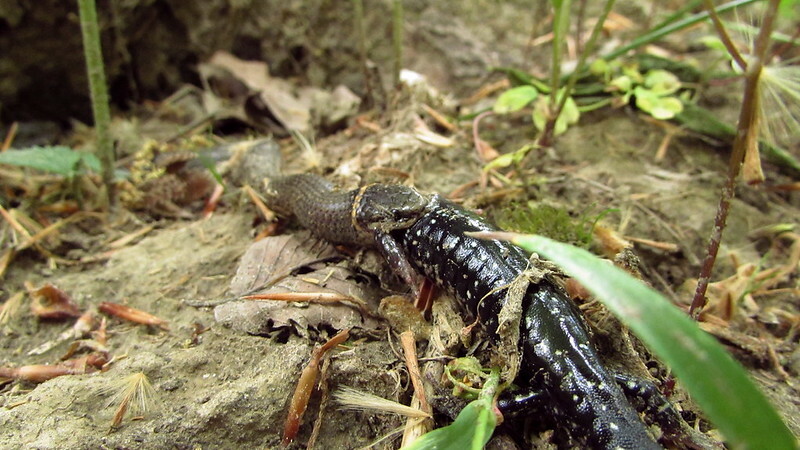 This looked like a classic stream for long-tailed salamanders, and it did not disappoint. Within several minutes of flipping, I found my first longicauda, a gorgeous juvenile ~8 cm long. Moments later, a subadult, ~10 cm, and then dozens more ranging from 5 cm metamorphs to 10-11 cm subadults. These long-tailed were noticeably different from the ones I was used to finding in central Ohio--they were generally less orange, with denser bars on the sides, lighter vents, and sparsely-patterned dorsums. Some had very pretty white speckling on their sides where the bars started (though, sadly, I didn't get any good pictures of these). 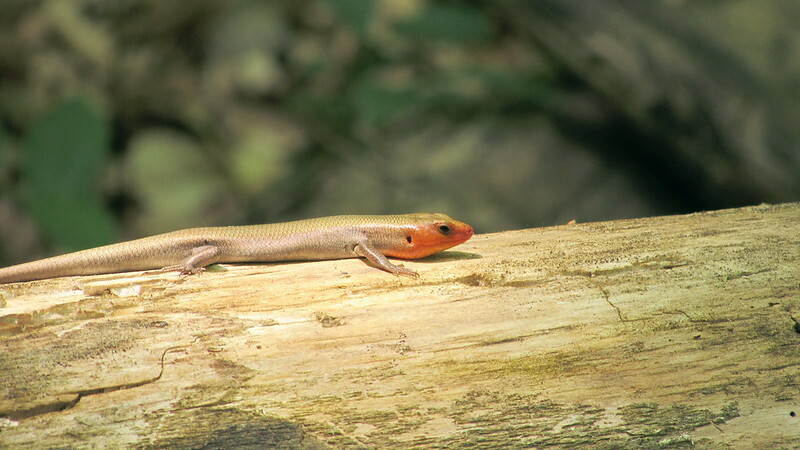 The range of variations of pattern, color, and build within and between longicauda populations will never cease to amaze me--it's no wonder early naturalists thought there were so many subspecies! 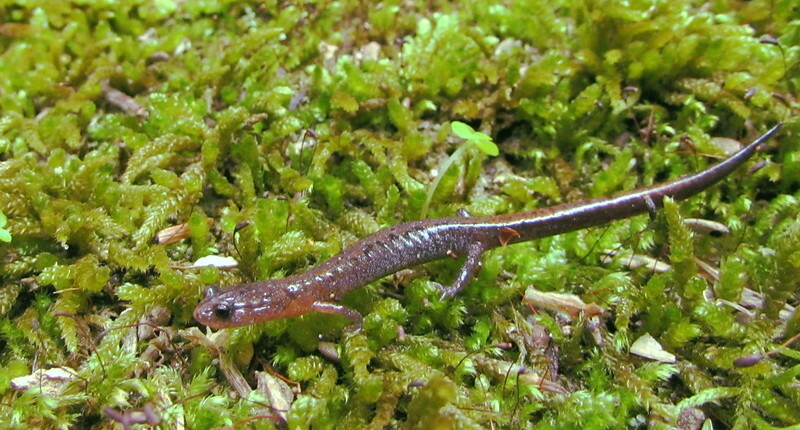 My next finds were several southern two-lined (Eurycea cirrigera) and a northern zigzag (Plethodon dorsalis--lifer!) that I initially mistook for a two-lined. As with the long-tailed, the zigzags showed great variability. I found about equal numbers of yellow-phase and red-phase zigzags; most of the red-phase were very light and had gorgeous silver-flecked sides. 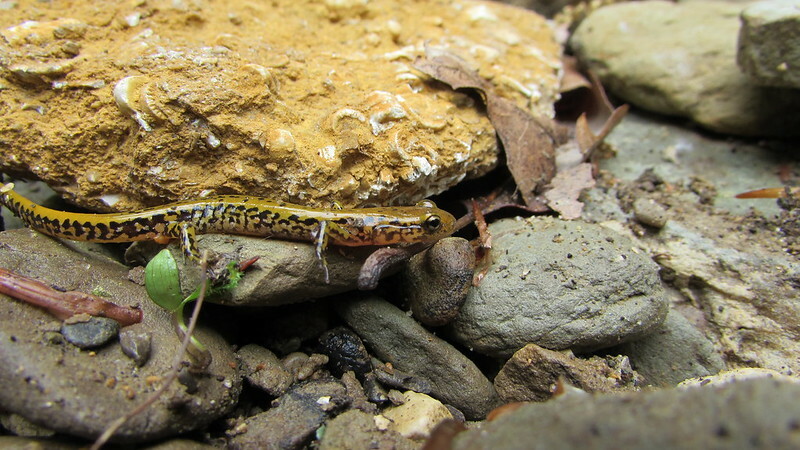 On one shady, sandy berm abutting a bend in the creek, I found probably 10 long-tailed, 3 two-lined, and 2 zigzag salamanders. 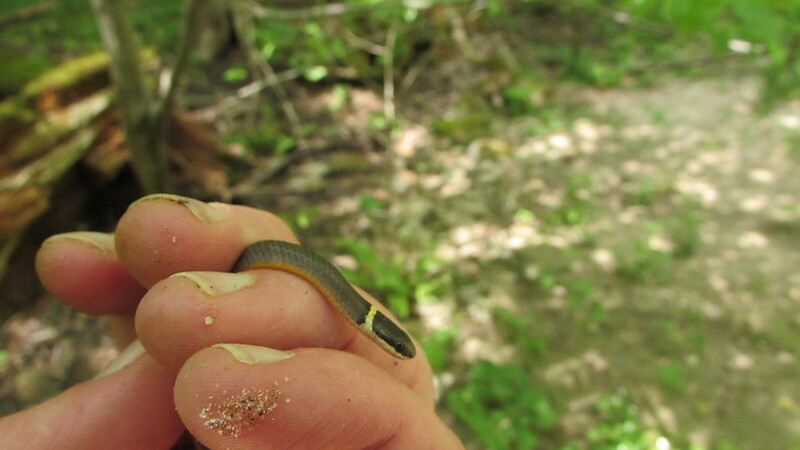 I also found two young (possibly yearling) northern ringneck snakes (Diadophis punctatus edwardsii--lifer!) 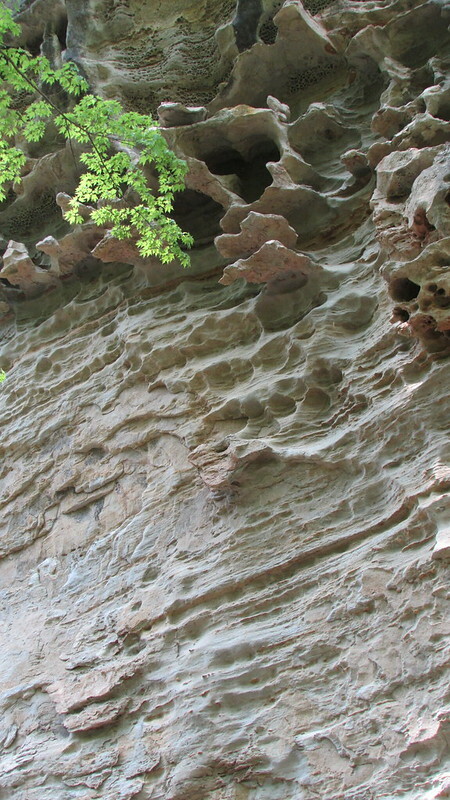 under large pieces of sandstone. No doubt, they were enjoying the plethora of small salamanders nearly as much as I was! My final new find for this portion of the expedition was a lovely ~9-cm slimy salamander (Plethodon glutinosus) with a very nice pattern on its sides. I was lucky to find this one, because my only other slimy for the day was in a real pickle, as you'll see shortly. Next, I headed back to Shades to check out some of the more rugged trails. Along the way, I came across a pair of broadhead skinks (Plestiodon laticeps--lifer!) chasing each other over logs and through underbrush on the side of the trail. One bolted before I could get my camera ready, but the other was quite bold, inching to within 1.5 meters of me before darting back to its safety log, then scurrying back for awhile, foraging through the leaf litter, and occasionally minding my movements. This went on for about five minutes, and was probably one of the most interesting encounters I've ever had with a wild herp. 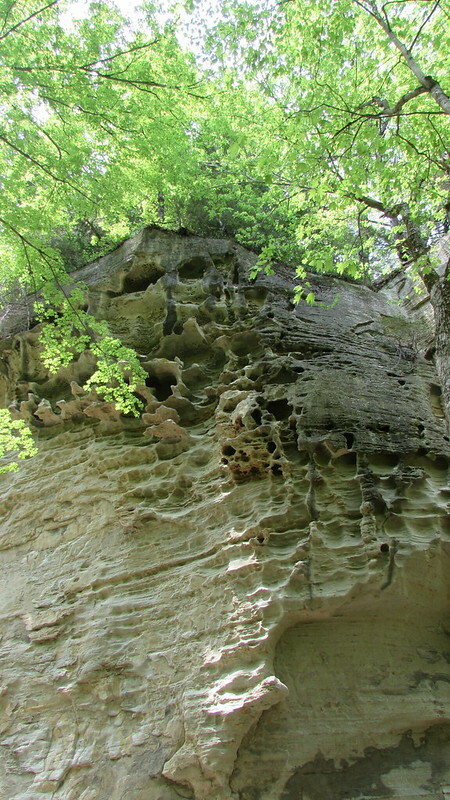 Finally, I reached my destination, the notorious Trail #4, which started near the banks of Sugar Creek and ascended a small intermittent stream bed, scaling boulders and ladders along the way. Right as I was approaching the trailhead, I found my second slimy salamander of the day, this one ~12 cm and quite plump. 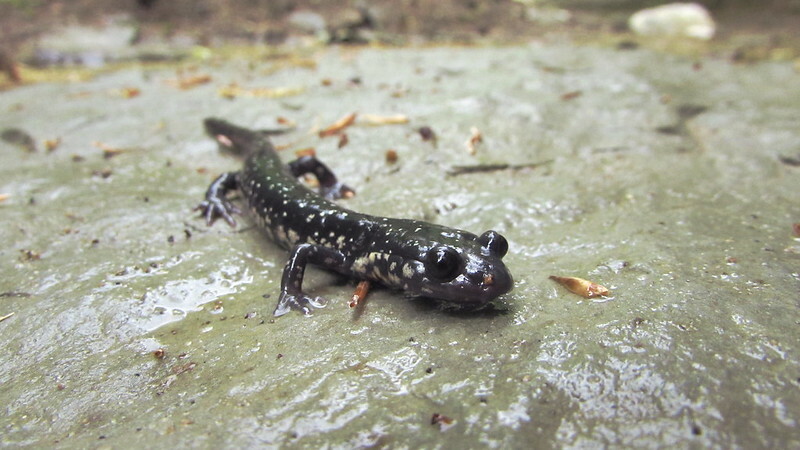 It was out in broad daylight, just at the side of the path--an unwise place for a salamander to be, I thought. 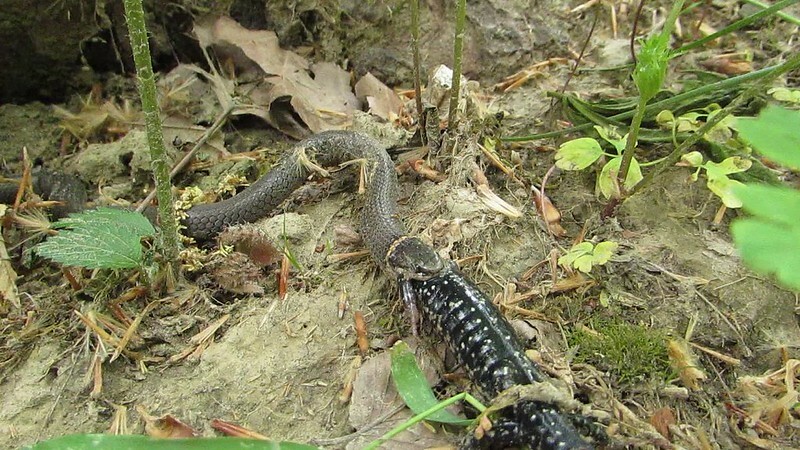 Additionally, it had found its way into the jaws of a ~40-cm long ringneck snake. I was really starting to question the judgment of this salamander! The ringneck was having a dickens of a time with the large slimy, but was in no mood to relinquish its prize, so I left it to it. After finishing the upstream slog of Trail #4, I was pretty satisfied that I'd seen almost everything I came to see (except cave sallies--I'll have to do a bit more research on where to find those! ), so I headed back to Chi-town. As icing on the cake, the northern Indiana truck stop I visited for a T-Bell & leak break had a menagerie of gratuitously trashy racist-uncle t-shirts. I'm talking "HEY SNOWFLAKE," eagles with American flag patterns on their wings, screaming skulls, the whole nine yards. Had I been literally anywhere else, I would've assumed they were satire. God bless Indiana.